From among a plethora of various gene delivery methods, the researcher must choose the right one according to availability for a given species and the precise application the transgenic animal is intended for. Here we review the progress in meganuclease and Sleeping Beauty transposon mediated transgenesis over recent years with a focus on medaka and zebrafish. We present a side-by-side comparison of these two approaches based on their biologic properties and provide interesting perspectives for future experiments and applications, which are different for the two techniques because of their distinct modes of action. Transgenesis, the introduction of transgenes into the genome of an organism and its appropriate expression in subsequent generations, represents one of the major technologic advances in modern biology. Ectopic expression of transgenes (gain of function) and disruption of endogenous genes (loss of function) in transgenic animals have proven to be highly valuable in extending our knowledge of mechanisms of development and developmental gene regulation, the action of oncogenes, and intricate cell interactions within the immune and nervous systems. By employing reporter genes under the control of specific regulatory sequences, transgenic techniques allow functional dissection of cis-acting elements that are responsible for spatial and temporal gene expression patterns. In addition, tissues or cells that express a reporter transgene can be used in cell lineage analysis and transplantation experiments. Furthermore, transgenic technology offers exciting possibilities for generating animal models that closely mimic human genetic diseases. Fish, with their external development of transparent embryos, are excellent candidates for the production of transgenics because they represent the largest and most diverse group of vertebrates and provide an ideal system for in vivo studies of developmental processes that take place during embryology. Two teleost fish species, namely medaka (Oryzias latipes) and zebrafish (Danio rerio), represent the most advanced fish model systems today. Despite many similarities, the evolutionary distance between medaka and zebrafish and their last common ancestor, about 160 million years ago, is reflected in many aspects of their biology. These species provide ideal resources for comparative studies, allowing the identification of conserved and species-specific molecular mechanisms that underlie development and evolution. Both model organisms are similarly amenable to transgenesis protocols, which can be broadly classified as viral and nonviral. Pseudotyped retrovirus infection has been used to generate single copy insertions of transgenes [1–3]. Present protocols using this approach are highly efficient at insertional mutagenesis and enhancer trapping  (Ellingsen S, Wittbrodt J, unpublished data). However, the construction, packaging, titering, and infection are laborious processes that require considerable expertise and safety precautions. Investigators in small laboratories who intend to generate only few transgenic fish may therefore wish to use simpler approaches. Nonviral technologies include a variety of different approaches, such as electroporation, particle bombardment, liposomes, stem cell transfection, nuclear transfer, and microinjection [5–19]. At present, microinjection provides the fastest and simplest means for germline transgenesis and transient expression studies in fish [20–26]. Here, we review two recently developed approaches to transgenesis in medaka that significantly enhance the potential of DNA microinjection. Both strategies are based on the use of enzymes that bind to DNA, mediate entry into the nucleus, and facilitate early integration of foreign DNA into the host genome. In combination with regulatory sequences or insulators, both techniques also guarantee stable transgene expression in subsequent generations. One technique involves the co-injection of the meganuclease I-SceI [22, 23], whereas the second is based on the Sleeping Beauty transposon [27–29]. The successful application of the endogenous medaka Tol2 transposon system in zebrafish is the topic of another detailed review included in this supplement . In addition, a good comparison of Sleeping Beauty and Tol2 has been published elsewhere . I-SceI is a homing endonuclease that is encoded by the mobile group I intron of the large rRNA gene of Saccharomyces cerevisiae [32, 33]. This family of enzymes mediates the propagation of the intron by cutting intronless genes at the site of the intron insertion. Like restriction enzymes, homing endonucleases cleave double-stranded DNA with high specificity in the presence of divalent metal ions. However, they differ from restriction endonucleases in their recognition properties and structures, as well as in their genomic location . In particular, whereas restriction enzymes have short recognition sequences (3 to 8 base pairs [bp]), homing endonucleases, despite their small size, recognize long DNA sequences (12 to 40 bp). They have been classified into four families based on both their sequence motifs and DNA cleavage mechanism . The protein I-SceI is a member of the largest class of homing enzymes, characterized by the presence of either one or two conserved amino acid residue sequence motifs (LAGLIDADG). I-SceI acts as a monomeric endonuclease of 235 amino acids, containing two conserved motifs . Its catalytic activity depends on the presence of magnesium or manganese. Cleavage of its recognition sequence (TAGGGATAACAGGGTAAT) results in a 4 bp overhang presenting a 3'-hydroxyl terminus . The enzyme exhibits low turnover because of a strong affinity for one of the products of the cleavage reaction . The recently resolved crystal structure of I-SceI bound to DNA attributes the high sequence specificity of I-SceI for its recognition sequence to numerous direct phosphate and base-specific contacts and water-mediated interactions . Theoretically, an 18 bp recognition sequence appears once in 70 billion bases of random sequence. Vertebrate genomes analyzed to date, including medaka, are free from I-SceI sites, abolishing the risk for genome fractionation by the meganuclease. Application of I-SceI in mammalian cells efficiently led to stably transfected cell lines with single copy integrations . Based on this, a simple, rapid, and efficient technique was established in medaka that allows the generation of stable transgenic lines by co-injection of the I-SceI protein with reporter vectors that are flanked at both ends by the corresponding recognition sites (Figure 1). The meganuclease approach has been used successfully in several fish species (medaka, stickleback, zebrafish), amphibia (axolotl, Xenopus), and ascidians (Ciona) [39–42]. Compared with conventional DNA injections, application of the meganuclease protocol increases the number of fish expressing a transgene in a promoter-dependent manner at 24 hours postfertilization approximately threefold. In addition, the level of mosaicism is strongly reduced and stable, promoter-dependent expression is achieved at up to ten times higher frequencies in injected embryos at 48 hours postfertilization . Ultimately, the frequency of resulting transgenic F1 offspring is enhanced by a factor of three compared with conventional DNA microinjection in fish. Uniform G0 expression in combination with elevated germline transmission frequencies is a good indication for an early insertion event. Meganuclease transgenesis in medaka results in germline transmission rates of 25% to 50%, which - together with enhanced G0 expression - indicate that I-SceI efficiently facilitates early functional integration of the transgene (one to two cell stage). Schematic representation of I-SceI vector microinjection. Microinjection for meganuclease mediated transgenesis should be performed as shown. Embryos should be oriented as indicated. The injection volume must not exceed 10% of the cell volume. (a) An I-SceI vector. The insertion cassette contains an expression cassette that includes the gene of interest and a reporter cassette. Two insulator sequences and two inverted I-SceI recognition sites flank the entire insertion cassette. (b) Injection is performed directly into the cytoplasm of the cell. Upon co-injection of DNA with I-SceI, this procedure will significantly enhance transient transgene expression and frequency of transgenesis. Injection without I-SceI will result in highly mosaic transient transgene expression and low transgenesis frequency, even if injected into the cytoplasm. (c) Injection into the yolk of a one-cell-stage zebrafish abolishes the enhancing effect of I-SceI. Transgene expression and transgenesis frequency will be similar to those with conventional microinjection. Therefore, injection into the yolk only should be avoided. GOI, gene of interest; INS, insulator; P, promoter; pA, polyadenylation signal; REP, reporter gene. Modified from Grabher and coworkers . Transgenic fish generated with I-SceI exhibit Mendelian segregation of transgene expression in F2, indicating that meganuclease-mediated transgenesis preferentially yields transgene integration at a single genomic locus. Moreover, transgenes insert as single copy or as head-to-tail tandem arrays of low copy number (one to ten) . Thus, the size of tandem arrays is considerably lower than is observed in standard plasmid injections (up to 2,000 copies), and transgene expression has been found to be stable for many generations [24–26]. How does I-SceI improve transgenesis? During the process of intron homing, I-SceI creates double strand breaks (DSBs). Does meganuclease create DSBs simultaneously in the host genome and the injected plasmid DNA to promote integration by a repair mechanism? The introduction of I-SceI mediated DSBs at specific hotspots in the host genome has not yet been systematically analyzed, but the existence of multiple endogenous sites is unlikely to occur because of the length of the recognition sequence (18 bp). Moreover, this hypothesis is in contrast to the finding of independent insertion sites in several medaka and Ciona transgenic lines. Recognition site mutation and deletion experiments in medaka revealed that nuclear localization mediated by I-SceI is not sufficient to improve the frequency of transgenesis. Enhanced frequency of transgenesis requires cleavage of injected DNA . I-SceI may counteract endogenous ligase and replicase activity, which is thought to be responsible for the strong concatemerization of conventionally injected DNA. Thereby, the transgenes remain as short fragments, exposing more recombinogenic ends. Through association with one of its cleavage products, I-SceI may accomplish 'inhibition' of endogenous ligases/replicases by cleavage of generated concatemeres or by protection of cleaved recombinogenic ends from degradation/ligation, or both. I-SceI induced DSBs allow recombination in the mammalian system at high frequency . Additionally, the natural homing process is thought to involve the host DSB repair system. Enhanced integration frequency is initiated by DSBs within the injected DNA and may involve direct interaction of I-SceI with the DSB repair machinery. Future experiments to identify interaction partners of I-SceI will help to elucidate the function of the meganuclease in transgenesis and to increase its efficiency further. Class II DNA transposable elements are discrete segments of DNA that are capable of moving from one locus to another in the host genome or between different genomes. They are distributed across the living world and play a fundamental role as motors of genome plasticity. These DNA transposons contain inverted repeats at either end flanking a central region encoding a transposase, which catalyzes transposition. Transposase-deficient elements can be mobilized if the transposase is provided in trans by means of an inducible transposase source or by co-injection of transposon and tranposase mRNA. Eukaryotic class II transposons move in a nonreplicative manner via excision and integration (cut and paste). For transposition, the transposase binds to the inverted repeats and cleaves the DNA, thereby precisely excising the transposon. Additionally, the transposase binds to the target DNA, introducing a staggered cut that leads to protruding single strands. The DNA repair machinery accomplishes integration into the host genome, resulting in target site duplications directly adjacent to the transposon ends. DNA transposons provide stable gene expression from a single-copy insertion and simultaneously tag the integration locus to facilitate subsequent molecular analyses. A variety of different transposable elements have been utilized successfully as tools for insertional mutagenesis and gene delivery in Drosophila [44, 45], Caenorrhabtidis elegans [46, 47], and plants . Until recently, they have not been used to investigate vertebrate genomes because most transposon systems that are active in a certain species cannot simply be transferred to vertebrates because of the need for species-specific co-factors for transposition. Moreover, only few well defined autonomous DNA transposons have been identified in vertebrate species . Homologs of the Tc1 element in C. elegans and those of the mariner transposon in Drosophila mauritiana are probably the most widespread DNA transposons in nature . Tc1/mariner-like elements have been found in many vertebrate genomes [51–55]. However, unlike Tol2 in medaka, all of the transposon copies isolated to date are inactive remnants of once active transposons. Inspired by the potential for a vertebrate transposon, Ivics and colleagues  engineered a functional Tc1/mariner-like transposon from inactive copies of several fish species and named it Sleeping Beauty (SB). The SB transposase has been shown to mediate transposition efficiently in cells from fish, mouse, and human in culture  and has been used as a genetic tool in mouse in vivo [56–62]. Within the past few years, SB has been developed into an efficient gene transfer tool also in medaka, zebrafish, and Xenopus [28, 29, 63, 64]. In medaka and zebrafish, the SB transposon system has been applied successfully to generate transgenic animals by co-injection of transposon DNA together with transposase encoding mRNA (Figure 2). Transgenesis frequencies (germ-line integration and expression in subsequent generations) were enhanced to more than 30% of the injected embryos, equaling I-SceI transgenesis rates. Also, the numbers of embryos that express the transgene in a promoter-dependent manner in G0 was improved fourfold compared with control injections in medaka. Using a second generation SB system, exhibiting improved transposition efficiency , genomic insertions were clearly mediated by the transposase in zebrafish [29, 31]. In medaka, on the other hand, the original SB system  did not prevent concatemerization of plasmid DNA and resulted in genomic insertions of plasmid tandem arrays . However, tandem array insertions also yielded robust and invariable expression during subsequent generations. Notably, using a moderate strength ubiquitous promoter to drive GFP expression led to efficient enhancer trapping, yielding spatially and temporally restricted transgene expression in 12% of the transgenic medaka. We hypothesize that such enhancer trap cases result from SB transposase-mediated transgene insertions to AT-rich scaffold attachment regions or matrix-attached regions. Such insertion lines provide useful tools for cell biology, cell lineage, and other developmental biology applications. SB vector microinjection. (a) Sleeping Beauty (SB) transgenesis vector. The insertion cassette containing an expression cassette that includes the gene of interest (GOI) and a reporter cassette is flanked by two SB inverted/direct repeats (IRDRs). (b) SB gene trap vector containing a splice acceptor site preceding a reporter gene. (c) SB enhancer trap vector. A minimal promoter drives expression of a reporter gene. 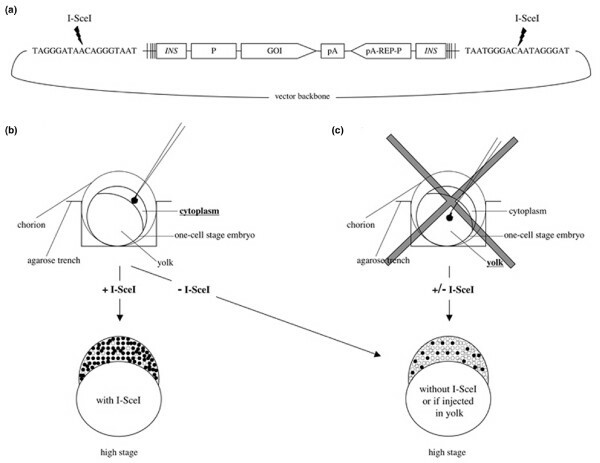 SB vectors are co-injected with SB mRNA into one-cell-stage embryos. MP, minimal promoter; P, promoter; pA, polyadenylation signal; REP, reporter gene; SA, splice acceptor site. In all SB generated transgenic medaka lines, transgene expression was stable for more than eight generations, indicating that even concatemerization of transgenes did not negatively affect gene expression. This phenomenon is in accordance with growing evidence suggesting an insulating activity of inverted repeats, which may account for stabilized gene expression by shielding from heterochromatin spreading [66–68]. Most, but not all transgenics yielded insertions at a single genomic locus. Thus, the SB transposon system provides flexibility. The transposon/transposase ratio can be adjusted empirically for robust transgene delivery and expression at a single genomic locus (trend: high/low) or for transposase-mediated single copy insertions at multiple loci (trend: low/high), favorable for insertional mutagenesis and gene or enhancer trapping (Figure 2). Similar applications may be envisaged for both meganuclease and transposon mediated transgenesis. Nonetheless, because of the different biologic characteristics of the two technologies, for certain applications one or the other appears more suitable. The meganuclease may be used in fish for comparative studies of cis-acting regulatory elements and homologous recombination. Direct comparison of regulatory elements is often hampered by effects on transgene expression mediated by the specific locus of insertion and/or distribution of episomal plasmid DNA. A meganuclease site artificially engineered into a host genome may serve as a unique entrance site for transgene integration. In lieu of embryonic stem cells contributing to the germline in fish, appropriate I-SceI sites could be introduced by transposon-mediated transgenesis. A suitable expression locus that is unaffected by the host genomic environment can then be selected and used for any kind of transgenesis and in particular to perform comparative studies on regulatory elements under controlled conditions. Further improvements in meganuclease transgenesis include insulators upstream and downstream of the DNA of interest to protect the transgene from influences of heterochromatin and epigenetic control of surrounding genomic sequences. Gene targeting in Drosophila has been attempted by using heatshock activated I-SceI expression in transgenic flies . However, use of I-SceI alone failed to yield gene targeting events, probably because of inefficient I-SceI activity and a highly efficient repair of chromosomal I-SceI mediated DSBs. Direct interactions of meganucleases with components of the host DSB repair are conceivable, because association of homing endonucleases with DSB repair is evolutionarily ancient. Indeed, meganuclease-induced DSBs are not sufficient to promote integration into the genome because injection of in vitro linearized DNA fragments resulted in lower transgenesis frequencies than did co-injections of I-SceI enzyme with DNA . This is indicative of an additional function performed by the meganuclease. Enhanced integration frequency may be initiated by DSBs, and direct interactions of I-SceI with the DSB repair machinery. The relative abundance of I-SceI enzyme injected into one-cell-stage fish embryos may compensate for the low activity observed in transgenic flies; thus, I-SceI meganuclease could provide a valid approach for gene targeting in fish. The efficiency of SB-mediated gene transfer is inversely proportional to transposon size [65, 70–72]. This is not an issue for insertional mutagenesis, in which the sole purpose of the transposon is to inactivate a gene and provide a short sequence tag for recovery of the insertion. For transgenesis, however, it is desirable that a transposon vector can mobilize large genes. Recent advances have been made in the development of hyperactive SB vectors, including the use of more efficient repeat sequences, transposases of higher activity, and application of 'sandwich' transposons that allow mobilization of large transgenes [65, 73]. Furthermore, CpG methylation of the SB transposon enhanced transposition in mammalian cells 100-fold . It is to be expected that these improvements in transposition efficacy also hold true in fish, which will be especially important for applications that require high insertion rates such as insertional mutagenesis and enhancer or gene trap experiments. A major advantage of highly efficient transposon mediated transgenesis for mutagenesis and trapping experiments is the possibility to remobilize transposon insertions by classical breeding of transgenic animals. One transgenic line would express the transposase, whereas the other would harbor the transposon to be mobilized. Among vertebrates, such experimental approaches have been successfully applied in mice and fish [56–59, 75–78]. Ideally, the transposon would contain a gene trap vector (Figure 2) to select directly for transposon insertions into genes and to reveal their expression pattern. Adding to the potential of the SB system, another artificially reconstructed transposon, namely Frog Prince, with high transpositional activity in vertebrate cells has been described . Pilot experiments in medaka confirmed the activity of Frog Prince in fish embryos (Wittbrodt J, unpublished data), providing the community with yet another promising tool. In recent years, meganuclease and transposon mediated transgenesis protocols had a major impact on research employing transgenic animals, in particular, fish and lower vertebrates but also mice. The relative ease of their application and the flexibility of both of these systems ensured their wide distribution and popular use. Owing to certain inherently different characteristics of these two approaches, further development of either system will probably result in more efficient and specialized applications. More advanced knowledge on the function of transposons has already generated the next generation of tools such as Frog Prince and Tol2. It will be interesting to see whether further insights into the mode of action of the meganuclease in transgenesis can contribute to standardized transgenic animals or a means to homologous recombination in medaka. We are grateful to our colleagues in the laboratory for critical and insightful input and helpful comments; to Thorsten Henrich for his pioneering experiments with SB; and to Erika Grzebisz for excellent animal husbandry. This work was supported by grants from the German Research Foundation (DFG) and the EU to JW.